If you’ve ever visited the Marais—specifically the Jewish neighborhood along the Rue des Rosiers—you’ve undoubtedly seen the long lines at L’As du Fallafel, one of the most popular Middle Eastern restaurants in Europe. 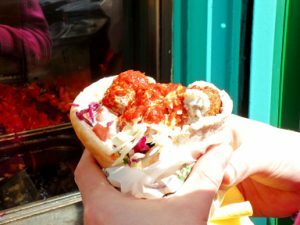 And virtually everyone orders the falafel served in a pita—deep-fried balls of ground chickpeas seasoned with garlic and other spices and covered with fried eggplant, pickled red cabbage, hummus, hot sauce, cucumbers and tahini. 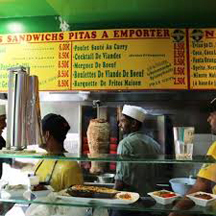 This specialty of the house even led to the restaurant’s slogan “Toujours imite, jamais egale (Always imitated, never equaled)”—and draws raves from both locals and tourists, and from in-the-know travel and food authorities. 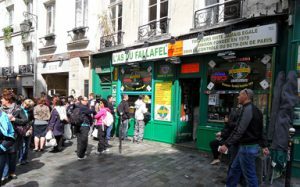 Indeed, the long lines that seem to be ever-present at L’As du Fallafel have included countless celebrities over the years, including musician Lenny Kravitz who calls the shop one of his very favorite eateries on the planet. 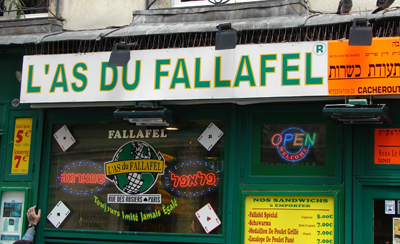 Founded in 1979, L’As du Fallafel (interestingly, a misspelling of falafel) officially calls itself a kosher Middle Eastern restaurant, but it also prepares several dishes inspired by North African cuisine. In addition to its signature falafel, the shop also sells such fare as shawarma (chicken or lamb), curried chicken, spicy beef sausages, chicken liver and chicken schnitzel. All of the above can be ordered as a “plat” or as less expensive pita sandwiches. There are also more than a dozen appetizers, including several varieties of hummus, as well as several drinks, including a handful of beers. There are a few tiny tables inside for sit-down service, but L’As du Fallafel is a mostly takeaway shop and part of the fun is waiting in line with all the other patrons for your falafel sandwich that’s prepared at an open-air counter so you can watch the staff quickly and efficiently assemble your order. And there’s almost always a worker out in the street hawking the restaurant’s fare in both English and French to draw in more customers—and to keep folks in line and the line moving. First, when approaching the sales window, you’ll typically order and pay for your meal while still standing in line; it’s not a scam, the guy really is an employee—and the staff member will give you a ticket to present to the workers at the window for your order. So you’re expected to have made up your mind as to what you’d like to eat before you get to the front of the line—hence that dilly-dallying comment above. Second, it’s cash only. No exceptions. And even though the workers usually have ample change, don’t expect them to easily handle breaking a 100-euro note for a 6-euro sandwich. A 20-euro note or smaller is ideal and exact change may even elicit a hearty “Bon!” from the order-takers. 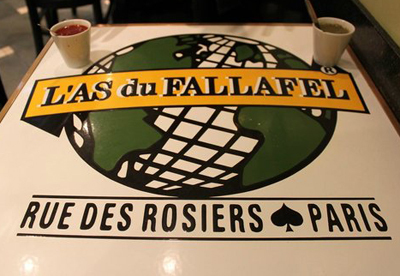 L’As du Fallafel is located at 34 Rue des Rosiers, and is open from 11 a.m. to midnight Sunday-Thursday, and from 11 a.m. to 4 p.m. on Friday when it closes early for the Sabbath. During the summer, the shop reopens from 6:30 p.m. to midnight on Saturday but during slower months the restaurant remains closed all day Saturday. 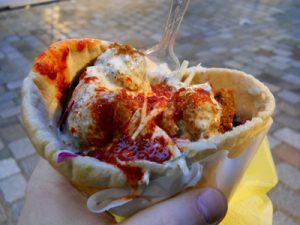 This entry was posted in Food, Marais, Restaurants, Rue des Rosiers and tagged Jewish Quarter, L'As du Fallafel, Middle Eastern cuisine by Bob Adams. Bookmark the permalink.